A benefit to joining in the fitness game later in life is that I get to play the part of the total neophyte. I get to be a scientist while I experiment on my body with exercise and nutrition to see what it’s really like. I reflect on the outcomes, consider changes I would make, revise and try it again. Now, I have to be honest and say that I already felt like I was a pretty established runner. I’ve been training for years for 5k’s and various self-selected longer distances and have run distances of about 8 miles or thereabouts, so I thought that I had this running thing pretty much in the bag. Yesterday taught me that running is truly something that changes with every mile further that you can endure. I did learn that I really can just go out and run at a slow jogging pace for 2-3 hours. It comes at a cost, but I was saying that for years and it was actually accurate. That’s kind of a nice feeling, but training is definitely important for those longer runs. The interesting thing is that the training is mostly in my head and only partially in my body. The body part seems more like math. If I wanted to run further distances, I would need to build up endurance by running longer and harder. Along with that, and very importantly, is pre-run (in the weeks leading up to a run) and on-run nutrition. My stomach started to get that feeling like when you’ve had your morning coffee and nothing else and you want to throw up, kind of, but really you just need solid food. That feeling. The gels I was sucking on were basically just liquid, the gu was liquid, essentially and I felt sickish. I always think I like to run on yogurt or some other similar dairy/protein/glucose hybrid, but Sunday taught me that, for longer runs, I need to figure out how to eat something small and solid. I remember a runner friend of mine mentioned his buddy took along frozen, bean burritos.  That seems so funny, but at the same time? It makes total sense! I also saw these waffle things at REI, marketed with the gels, that I think would do the trick nicely. I’m not sure if it was the distance or the time moving that truly exhausted me, but I was motivated to keep a good pace until I got to ten miles. At the ten mile point, I got all excited that I made the double digit milestone. Then I realized I still had an entire 5K in front of me. This is where I had to really put myself to the test. I was done at ten miles and totally, definitely finito by 11 miles in. Bradley texted me and asked how I was doing. I honestly texted back that I was tired, and it was probably the worst thing that I could’ve done. As soon as I admitted that to him I admitted it to myself, too, and went into a downward spiral of being tired and allowing those negative feelings to overtake me. I quickly realized what was happening and made the active decision to shift my brain’s focus elsewhere. I realized that if I stayed focused on being tired, I was going to stop and walk. The race became a totally mental one at that point. I looked to my music. I was over it. I tried to think about the scenery. On a there and back kind of race, I had already seen it once and was over it. Super over it. I just wanted a car to come fetch me. You know that pep talk that I referenced yesterday? 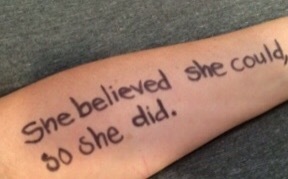 The one complete with the quote, “She believed she could, so she did,” written on my arm? That conversation was instrumental in my success. I despised that version of me in those last two miles in the same way you despised your parents when you were a kid for making you eat beets and clean your own bathroom. I told myself to shush when I said that I was doing great. That I was amazing. That I could really do it. That as long as I took it one step at a time it’d be over before I knew it and I’d be sipping my soup with Jessica… Still, I was surly and bratty in my attitude. I didn’t want to do it anymore. Though I trotted on, I was having a full-blown tantrum in my head that I was having to talk myself out of over and over. I swear, I teach little kids because I have so much in common with them. Time after time though, every time I’d want to really give up, I’d force myself to read that quote and I swear to you that it totally kept me going. It did not feel good at the end and I didn’t care much about the finish line, but I knew the chick who wrote that on my arm the night before while spouting affirmations sure would be peeved if I stopped with less than two miles to finish. That’s only one extra- large loop! Two smalls! You can do that in your sleep! And it worked. I finished. I still am in disbelief. As I hobbled around all day today I was constantly aware of my sore body that was all worn out from running 13.1 miles the day before, and I just felt good. Proud. I finally did something that really impresses me. Lost a bunch of weight? Cool. 5K. Sure. 10K? Getting somewhere. Half marathon? Utter disbelief. I did that. Like, me. Formerly 340 pound, totally out of shape, never-ran more-than-a-mile-in-her-life Tamara Littlejohn ran 13.1 miles? I swear, ten years ago I’d never have believed it. Maybe I’d have been able to believe that I’d lose some weight, but not this. Today I just felt amazing- and not to others, but to me! So amazing that I looked in the mirror and saw a beautiful, incredible, strong woman. I wasn’t critical, for once, instead I just allowed myself to see what I’ve accomplished. Even though I generally avoid bathroom selfies at all costs, I took one today, just to capture that moment when I saw myself. Half’s are hard but following a training plan and eating the right foods leading up to the race (and training runs) makes a big difference. I’m sure if you do that next time you’ll see a difference in what your body can do…and how long it takes to recover after. But not matter what the big thing is you did it! So excited for you!